February 8, 2016 – Today, we’re riding in Great White Coach with the father of our country. 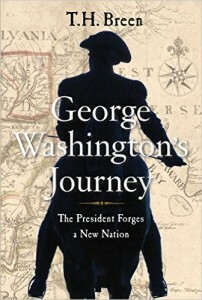 Our teamster is author Timothy Hall Breen, and his book is George Washington’s Journey: The President Forges a New Nation . Aware of the fragile and fractured nature of the new republic after independence, Washington resolves — in a day without maps or roads worthy of the name — to take the federal government to the people. Staying in simple inns rather than fine houses, and suffering through terrible food and bad treatment for his horses, Washington visited every one of the thirteen states, and left a candid assessment of his opinions, as well as funny moments with the people — and a few where he nearly died. Mr. Breen is the James Marsh Professor at-large at the University of Vermont and the author of eleven books on American history including, The Marketplace of Revolution: How Consumer Politics Shaped American Independence. You can follow him @TimothyHBreen on Twitter.